Since 1973 exists in Bukit Lawang in Gunung Leuser National Park on Sumatra – the orangutan rehabilitation centre, where orang utans can be viewed in the jungle. Former captivated orang utans are here set free, back in their natural environment. 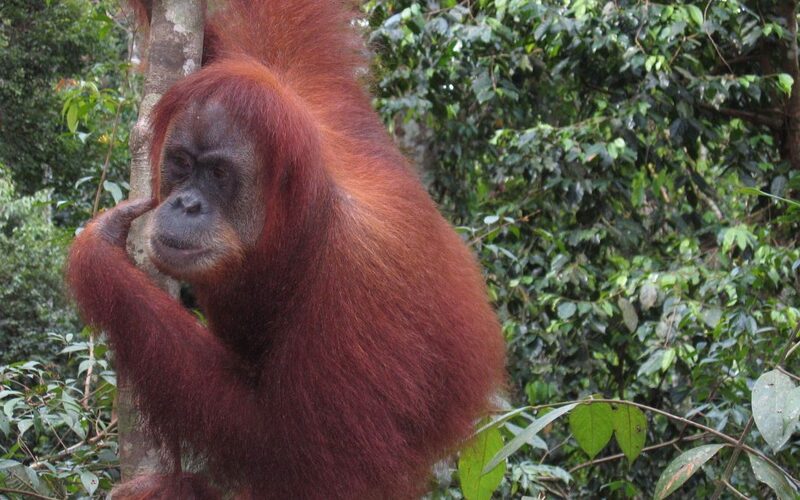 Since the feeding centre has been abolished, you can now see orang utans in the wild during a guided jungle trek. The shortest trek is 2-3 hours. Only at two places orang utans can be seen in the wild, in Bohorok / Bukit Lawang in Gunung Leuser national parc in Indonesia and on Borneo. People from all over the world come to Bohorok to see these beautiful friendly animals. A Rewarding Journey To Bukit Lawang in Gunung Leuser National Park on Sumatra with Tri Jaya Tour & Travel. In this impressive jungle area, longer treks can be made like a half or full day. Also, trekkings of several days is possible whereby people stay overnight in the jungle in a tent. The village of Bohorok is divided by the wild streaming Bohorok river. Suspension bridges give passage to the other higher river bank of the river. Perks of Traveling With Tri Jaya Tour & Travel To Bukit Lawang in Gunung Leuser National Park! Starting from Bohorok, it is also possible to have an adventurous rafting experience over the Wampu river.